Craving for pleasure in a 9-inch package? 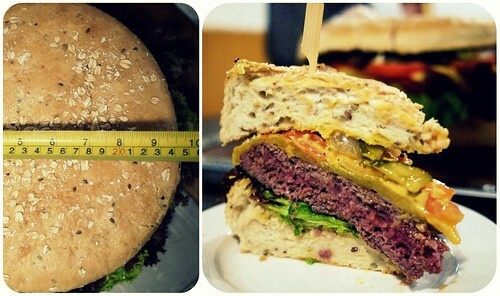 A 6 kilogram wonder – 2 kilos of freshly ground juicy beef patty, 1 kilo of cheese, 1 kilo of pickles, tomatoes and greens, and 2 kilos of multigrain bun that tries to make this healthy. And the true test of a good burger? Lift it up, hold it between your fingers as the juices drip down your wrist, and take a big chomp through the entire cross section. Then lick up the spillages. Talking at this point is not advisable. It’s no secret that I’m a fan of The Daily Grind. When the owners invited me over to try this monstrosity of a burger, I went for a medical check-up first before agreeing. Eating a burger this size is like preparing for war. You have to be prepared. Nah. It’s meant to be shared – lah. For us Malaysians, communal dining is nothing new. 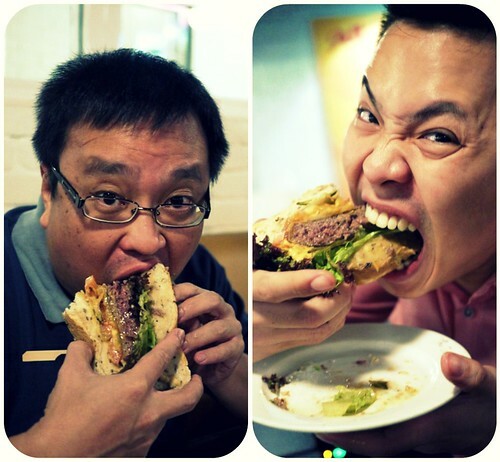 If we can sup over rice and curry and ko lou yoke, we can certainly sup over a giant burger. What an amazing bonding opportunity. 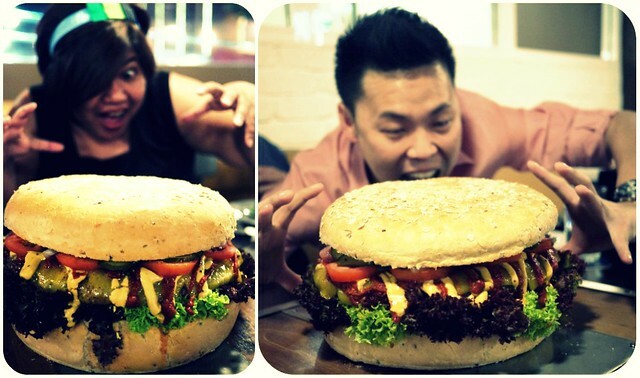 This burger can easily feed 10 to 12 persons. The price? RM360++. Please order 48 hours ahead because something this size needs tender loving care and planning. I’m still talking about burgers, of course. The Daily Grind Ampang, Brunch & Dessert HGW KY eats – Burger Bobby Simpang 3 McD Jr. Country Grilled Chicken Burger is back? Kraze Burger@Incheon airport, Seoul The Daily Habit – New Opening Hours, Bangsar Shopping Centre, Kuala Lumpur, Malaysia The case of the disappearing giant macaron The ABC combo : Afternoon+Burger+Coffee@Buns burger bar & Olle Cafe, Desa Sri Hartamas McDonald’s Spicy Korean Burger (Burger Korea Pedas) Hand grind single origin coffee Finally…I get to eat this ever famous burger@Burger Lab, OUG.